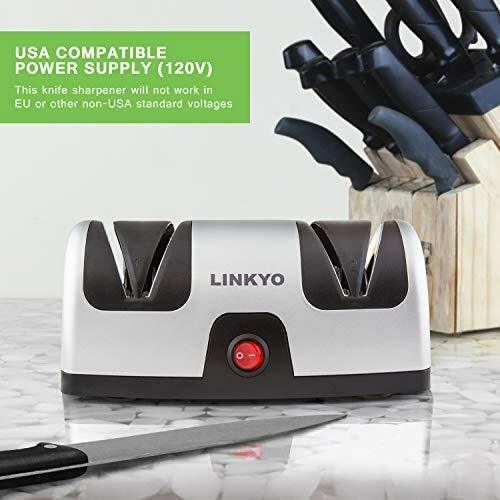 The LINKYO Electric Knife Sharpener is an effective and high-impact knife sharpener designed with two-stage sharpening technology, ideal for a razor-sharp edge. Linkyo Electric Knife Sharpener is the most affordable model in the market. Click on image to check lowest price and review. Constant cutting and carving can lead to blunt blades, making it difficult to do even the simplest of cutting chores. Thus, this sharpener has been designed keeping in view the issues a chef can face while working with dull blades and cutters. With such an affordable price, you won’t believe this low-budget electric knife sharpener can deliver such results with thousands of good feedback and reviews. If you are skeptical about it, this review could clear up a few things. Selected from the best-selling category, Linkyo knife sharpener has been appreciated by customers for its exceptional performance and lasting build. Have a look at its features and decide for yourself. The LINKYO Electric Knife Sharpener is extremely easy and quick to use. The knife sharpener uses two-stage sharpening. The first stage sharpens the blade, while in the second stage, the blades are honed and polished. The product is for straight blades and cannot sharpen scissors or serrated blades. A non-slip suction cup help keeps the sharpener in place. There is a built-in stop feature that helps prevent damage to the knife in case you apply too much pressure. It is suitable for knives made of alloy, carbon or stainless steel. It includes one slot for each side of the blade. It does not require any downward pressure. Creating a razor-sharp edge is a breeze with this electric knife sharpener. The dimensions of the product are 8.25 (L) x 5.75 (W) x 3.25 (H) inches. A 3.5 feet cord along with a polarized plug is included. The weight of the knife sharpener is 2.65 pounds. Preparing a meal with a blunt blade can take a lot of time, which is why sharpening dull knives are necessary. 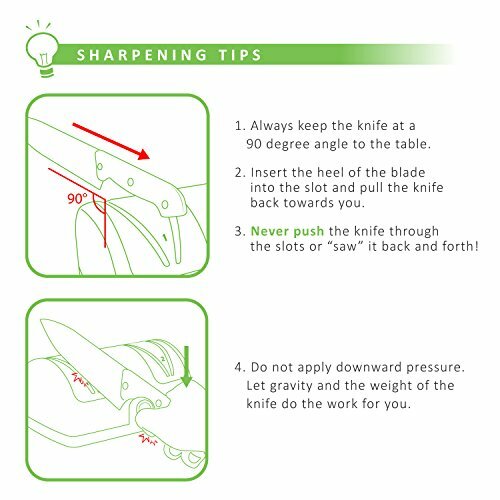 With the LINKYO Electric Knife Sharpener, you can achieve professional blade sharpening at home. It uses a two-stage sharpening procedure. The first stage shapes the angle while rejuvenating and sharpening the edge, whereas the second stage hones and polishes. Received more than 2000 reviews on Amazon. Click on image to check lowest price and review. The non-slip suction cups hold the sharpener in a firm position during usage, while the blade positioning guides point the blade at the ideal angle for optimum sharpening. Typically, it requires about 90 seconds to provide a sharp edge, but if it’s just a quick touch-up, it normally takes 10 to 15 seconds. It is recommended to place the knife sharpener on a flat surface for convenient usage. Know what type of blade you’re trying to sharpen as the LINKYO Electric Knife Sharpener only works on flat blades. It does not work on scissors or ceramic knives. 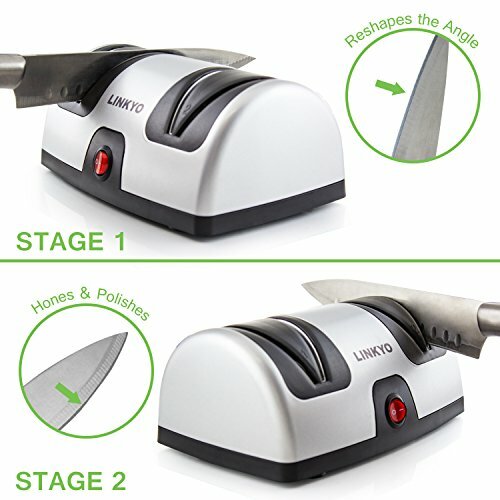 The LINKYO Electric Knife Sharpener is easy to use once you know the technique. Start with plugging it in and turning it on. Be sure to clean knives with warm water to get rid of any dirt or debris. A clean knife will make the sharpening process more effective. After you have cleaned up the knife, just run it through the slots made for the blades. Pull the knife towards yourself at a 90-degree angle. It does not require any downward pressure. A built-in stop feature stalls the motor if too much pressure is applied so as to help prevent damage to the blade. It is an easy and automatic way to bring those dull blades back to life. This is a simple, yet effective 2-stage sharpener that everyone can get super sharp knives without the extra skill or training required. Whether you’ve thick or thin knives, it is evident that a few minutes spent into sharpening and polishing will turn dull knives to a razor-sharp edge. The body is well-built, although it isn’t a steel finish. The sharpening wheels are well concealed and risk- free. So far, there wasn’t any accident reported using this sharpening machine. The Linkyo sharpener is very simple to operate as it only requires plugging in the power cord to get it working. What makes this unique from other design is the built-in stop feature that will stall the motor to prevent damage to the blades. This serves as a safety feature and a reminder to users to handle knives gently. Sharpening a knife does not require too much downward pressure to grind the blade, regardless of alloy, carbon or stainless steel. This is the advantage of using the electric knife sharpener as the motor will do the hard work for you. Clearing the metal filing is really simple. The metal shards and filings can be easily caught by the easy-to-remove plugs, making cleanup a snap. Of course, cleaning the body can be as simple as using a damp cloth. When it comes to price, this is a budget-friendly sharpener we believe everyone wins. However, it has some drawbacks like many other high-end sharpeners but it’s nothing to worry about. Not all sorts of blades can be sharpened by this unit. You may not get good results with hunting knives or other short blades. Some scratches were detected along the blade using this sharpener but based on the low-price-high-performance feature, we still considered it value for the money. Looking for High Quality Electric Knife Sharpener? If you’re looking for a mid-to-high-end sharpener with good features other than the Linkyo sharpener, visit this page – best electric knife sharpener to compare the functions and prices to get a better picture of what you need. Sometimes, it is wise to explore further to expand your horizon. We see many people willing to spend a little more to get the best of the best sharpener if only they knew those features earlier. Many people have their preferred brands due to quality and reliability. For quality wise, do spend a little more time to check out Chef’s Choice Electric Knife Sharpener and Work Sharp Electric Belt Knife Sharpener. Both of these brands are popular in terms of built-quality, versatility, and reliability. Always clean the knives beforehand using warm water to remove dirt and debris. This will make the process much more effective. Also, it helps to prevent grease and food debris that stick to the abrasives so as to maintain the effectiveness of the sharpening material. Next, in order to get the correct angle on the edge, always stick the blade close to the side of the automatic angle guides. This will ensure the knife will not wobble when it is pulled along the slot. Pull the knife slowly towards yourself at a 90-degree angle to achieve maximum results. The final result is always very pleasing if it is done right (see below image). Safety always comes first, so remember to maintain a barrier between your fingers and the blade when you sharpen the knife. Do not attempt to sharpen scissors using the electric knife sharpener as scissors are essentially two knives set in opposite positions, making it impossible to do so. Always clean the electric knife sharpener with a damp cloth after each use. Do not submerge in water and no lubricant oil is required to make it work better. The LINKYO Electric Knife Sharpener can effectively be used by professional chefs for rejuvenating dull blades and quick touch-ups. If you’re not a regular cook, keeping one at your home is still recommended as it saves you the time and energy of getting knives sharpened professionally. The electric sharpener cannot be used for hunting knives or sharpening scissors, though, as it only works on flat blades. If you want a convenient yet effective sharpening unit, this electric knife sharpener could be the ultimate choice. The easy two-step sharpening and honing technique will give knives the extra shine and razor-sharp edge. Not everyone has the time to learn meticulous sharpening and honing techniques or going to a professional, so by keeping an electric knife sharpener at home, you can greatly reduce your cooking prep time. The LINKYO Electric Knife Sharpener is the choice of many professional chefs and home cooks. It serves the purpose well without going over budget. With its high-impact performance and convenient size, it can easily fit in your kitchen, providing you with the ultimate culinary experience. How to Choose Electric Knife Sharpener – Features or Price?